As well as a passion for the open waves, the making of any successful boat captain is experience and training. Whether it’s captaining a passenger ferry, delivering sailboats around the globe or skippering a luxury private yacht, there are a multitude of career channels open to those with ambitions of making a living at the helm of a vessel. Although the career opportunities may vary widely the journey to these destinations is a fairly standard one because each are united by one overriding requirement - responsibility for crew, passengers and ship. Superior skills and experience therefore form the backbone to any career path for a future captain. Starting out as a deck-hand is a great way to earn hands-on experience at sea but, however instructive, on the job training is no way to work up the career ladder, as it cannot replace official instruction. It is rare to secure official skippering roles without recognised qualifications and any crew member with aspirations of a more senior position will at some point need to sign up for official training. Thanks to the Royal Yachting Association’s (RYA) clear-cut course and certification programme, acquiring the necessary skills and certification to become a captain is a reassuringly straight-forward process. Once a particular course has been completed at a RYA approved training centre and the appropriate ‘Certificate of Competence’ awarded, a standard of capability on board ship has been attained that is recognised and respected worldwide. A particular Certificate of Competence will immediately assure any employer around the globe of your standard and the quality of your training in attaining it. Its tiered system means that you start at the bottom and work your way up, one distinct level at a time. Beginner motor cruiser skippers would, for instance, start out with the introductory ‘Helmsman’ course, and then move up to ‘Day Skipper’, and then ‘Coastal Skipper’, and with each step up the training ladder their job prospects widen. Whether its navigation, helmsmanship, meteorology, safety procedures, there are certain abilities that are essential to any skipper’s skill set whatever discipline they later choose to pursue. The main RYA courses are designed to teach the core skills. This means that you can always decide to change direction later on in your career because you have the principal skills universal to all disciplines. Nevertheless, before undertaking the RYA course programme there are certain basic career decisions you do need to make. Firstly, do you want to want to take charge of a motor vessel or a sailboat, and secondly, do you want to sail in tidal or non-tidal waters? 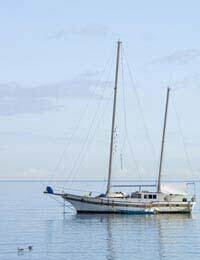 RYA courses are modified to suit these particular wants. The standard ground level trainee courses for yacht or motor boat skippers are ‘Competent Crew’ and ‘Helmsman’ respectively. Neither of these courses requires any prior training or assumed knowledge and both include core basics such as helmsmanship, boat handling, safety along with variants according the boat type. At the next level, these basic skills are developed further as part of the respective sail or motor-based ‘Day Skipper’ courses. On completion trainees should be able to skipper their vessel on short passages by daylight. By the end of the next stage, ‘Coastal Skipper’, trainees are confident enough to skipper their vessel down complex coastal passages by day or night. All of these hands-on offshore course levels should be combined with complementary onshore theory-based courses, which include aspects such as navigation and meteorology. The ultimate aim for any aspiring skipper is the top tier in its programme – the RYA Yachtmaster Certificate of Competence. This worldwide respected qualification is undeniable proof of your experience and competence as a skipper. Unlike the other qualifications this is not attained through formal training. Instead, if you are convinced you have the necessary experience, skills and knowledge then you put your name forward for an exam in order to test your claims. If at any point you want to use your RYA certification to secure employment on a commercial craft then you first need to have it commercially endorsed. This endorsement is printed on your certificate as official confirmation that its holder has undergone additional training and a medical fitness test and of what vessel type and purpose you are approved for.